Open Services for Lifecycle Collaboration (OSLC) is a community that writes specifications to integrate software. Learn more at Why develop OSLC applications and at our main site. The description on YouTube includes a table of contents and links to references. For a more detailed look at what goes into OSLC support, read through our tutorial “Integrating Products with OSLC”, which walks you through building an adapter that adds OSLC support to the popular Bugzilla defect-tracking software. The concepts in the tutorial are broadly applicable to other software. The tutorial has working sample applications and detailed instructions for running them. Integrating software is hard; we want it to be easier. And we need your help. We define standardized ways to represent common resources in software development (for example, a defect or a performance test). We also define standardized methods to allow other applications to access, display, preview, find, create, and update those resources. With standardized resources and methods, any tool can access and manipulate the data and artifacts from any other compliant tool. So instead of a variety of fragile point-to-point integrations you have one common way to connect and integrate many products. It’s not quite plug-and-play, but it’s close. We want OSLC to succeed because better and easier integrations will save everyone time and money. And we think that software with OSLC integration has a competitive advantage. Don’t just take our word for it. Icaro Technologies estimated that they could have saved two million dollars over two years if they used OSLC standards for a project with more than 10 integrations. And major industry groups like SPRINT and EADS have decided that OSLC-compliant software can help them collaborate and verify requirements on highly complex products like commercial airplanes. OSLC specifications are free to adopt, and we want them to spread. So help us out! If you’re new to linked data and RDF, we’ve put together a playlist of videos that can help you catch up. You should be familiar with designing RESTful applications. For OSLC implementations, you must use HTTP protocol. We require services and resources to be represented in RDF, but you might prefer to supplement that with a variety of machine-readable and human-readable formats like Turtle, JSON, or HTML. Instead of string parsing and regular expressions, you will definitely want to explore using an RDF parser such as Apache Jena. OSLC does not require OAuth, but it is the most common approach for managing authentication between clients. The OSLC Core specification defines the basic patterns and protocols that any OSLC software must implement. The other workgroups define additional resources or extend existing ones, but they do not add new protocols. To explore some of our other specifications, the OSLC Core Workgroup maintains a list of OSLC vocabularies and specifications that includes relationship diagrams. You do not have to use the Eclipse application to use Eclipse Lyo: Although much of the documentation assumes you will be using Eclipse, the source code is available in a Git repository and much of it does not require the Eclipse application to work. If you’d like to explore some existing code, there are a variety of samples and existing applications available. The Communications Workgroup has a list of Open Source OSLC projects (along with their licenses). If you’d like to explore a basic application that provides OSLC Service Provider resources and UI previews, Vijay Kalangumvathakkal of developerWorks has some simple applications available to download and try out. Our tutorial walks you through a working adapter that adds OSLC Change Management support to Bugzilla and a simple consumer application. The Lyo Client component in Eclipse Lyo includes additional APIs and sample code that addresses a variety of common OSLC use cases including login, OAuth, service discovery, and queries. The OSLC4Net project includes sample applications if you favor .NET/C#. Eclipse/Lyo provides a set of Java based APIs and generative tools to support the creation of OSLC domain servers and integrated client applications. While Eclipse/Lyo provides a very rich and robust platfrom for OSLC development, it has a relatively high learning curve and that can increase development time, costs and risks. The following sections provide a brief description of each OSLC4J sub-project and provide links to the development sites and related work products. The figure below shows the relationship between the modules created in the projects, and how they are assembled into a Web application. 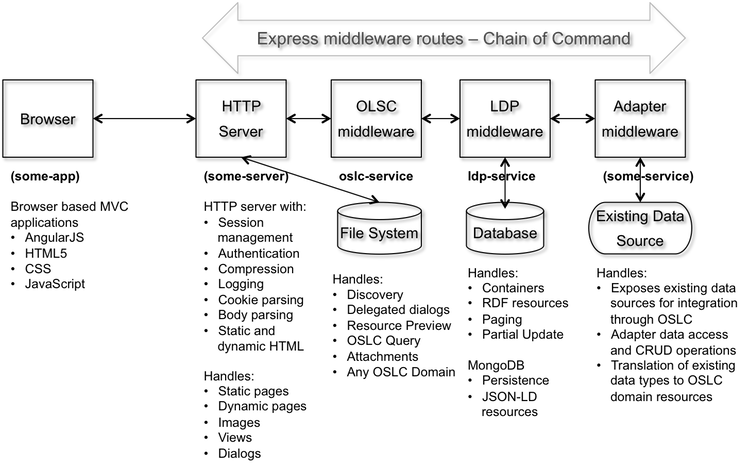 Adapter middleware in the figure represents some Express.js middleware component that provides CRUD access to some existing data source. This provides a simple way for vendors to provide OSLC access to their data sources without having to implement the details of OSLC and/or LDP. A oslc4js Slack Channel has been created to facilitate collaborative development of these Open Source Projects.